If you wish to work as a Chartered Psychologist (in any particular discipline) you will need to undertake a period of post graduate study once you have completed your undergraduate degree. This note assumes that your undergraduate degree was validated by the British Psychological Society (BPS) so as to provide what is technically known as the Graduate Basis for Registration (GBR). If this is not the case, you can still commence post graduate study but you should have a look at the article that considers this in detail. As with undergraduate degrees, the actual teaching will take place in one of the UK's Universities. The number of Universities that offer postgraduate study is much less than those who offer undergraduate study. Equally for most courses, you will need to be sponsored (usually) by a NHS Trust/Board where you will undertake the work placement part of your training. A list of the Universities and the courses they offer can be found on the BPS website (http://www.bps.org.uk/careers/accredited-courses/accredited-courses_home.cfm?action=postgrad). The courses are often over-subscribed so making an early application, and being able to demonstrate real commitment, are important. Chartered Psychologists work in a number of fields such as Clinical, Sports or Education Psychology. Each of these has subtly different approaches to the form of post graduate education required. For example the route to working as a Chartered Clinical Psychologist involves a 3 year (full time) degree that combines academic and practical work and leads to a Doctorate in Clinical Psychology (i.e there is a substantial amount of primary research as well as the practical study). On the other hand Health Psychology tends to involve a one year (full time) MSc (although some Universities do allow you to extend this to a doctorate if you wish). On the other hand, many Universities offer post graduate degrees in psychology that do not lead to careers as a Chartered Psychologist. These will often reflect the research focus of a particular department (e.g. Addictive Behaviour, Decision Making) or provide research training. Such post graduate degrees are valuable if you see your future as an academic or as a research psychologist. 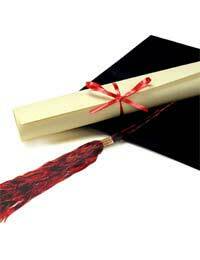 These masters degrees may also allow you to go on to complete a conventional doctorate (i.e. without any embedded clinical or work placements). The subjects on offer will vary substantively from University to University and there is no formal centralised listing of the programmes on offer. The degree will usually take 1 year full time or 2 years part time. There are a range of post graduate degrees in psychology. Essentially if you wish to work as a Chartered Psychologist you will have to follow a particular type of study that will combine academic study with practical placement. If you want to continue your studies in psychology but not to work as a Chartered Psychologist, then there are a wide range of degrees. These will often be very specialised and reflect a range of academic research areas. You will find that entry to post graduate study is competitive. You will usually need a good (2/1 or higher) undergraduate degree and be able to convince admissions tutors that you are fully committed to your chosen career. Hey, I just completed my degree in Sociology and Psychology. I want to go on to do the forensic psychology masters, however my degree is not BPS accredited. Would I still be able to get on to the masters and will I then gain the accredit from doing the masters? @sharmargo. Check with a course provider. It's most likely that you'd have to do an entire degree. Hi I am 46 years old. I completed a degree in early childhood studies in 2009.I was wandering if I could do some sort of conversion course to become a child psychologist or would I have to do a complete degree? Hi i did a degree in criminology 4 years ago. I ended up working in an office processing invoices! I was wondering if I could do a post graduate course using my criminology degree in order to become a forensic psychologist, or would I need to do a complete degree?